Libyan leader Moammar Gadhafi's war chest might have been large enough at one point to support fighting against rebel forces, but how much Libya's Transitional National Council can extract after Gadhafi's reported death remains to be seen. Gadhafi had $200 billion in bank accounts, investments, and real estate around the world before he was killed, according to the Los Angeles Times. That figure is much larger than previous estimates that Gadhafi and his family had an estimated $33 billion and $60 billion in unaccounted money around the world. The country's oil wealth, as the world's 12th largest oil exporter, was a source of high-living not necessarily for Gadhafi but for his children. Robert Powell, senior analyst with the Economist Intelligence Unit, part of the Economist Group, said that while Gadhafi lived relatively modestly, generally staying close to his nomadic roots, his children were less traditional. Powell said Gadhafi lived in tents, and tried to set up camp when he traveled abroad as well. "His children generally went a little bit off the rails and really enjoyed the high life," Powell said. Libyan rebels announced in August they had captured three of Gadhafi's sons, including Seif al Islam Gadhafi, his second-eldest son and his reported expected successor. In addition to Seif al Islam, his brothers, Saadi and Mohammed Gadhafi, have reportedly been arrested. Mansour El-Kikhia, a professor of political science at the University of Texas, San Antonio, said Gadhafi and his children helped themselves to the Libyan treasury without accountability. He said some of his children had large private yachts, planes and property in cities such as Geneva, Vienna and London. Powell said the Libyan government was "hugely corrupt" and dominated both the political and business networks of the country. 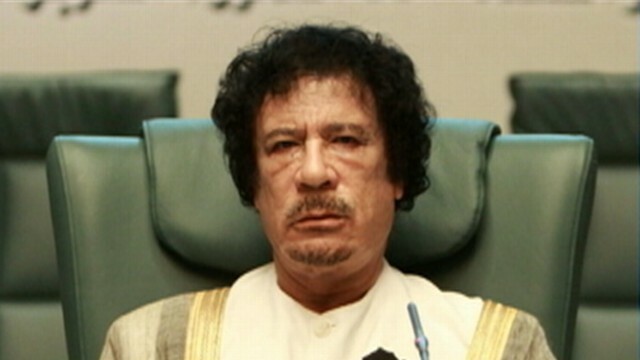 "They paid themselves out of government coffers and gave themselves official roles," Powell said of the Gadhafi family. Daniel Serwer, a senior fellow at the Johns Hopkins University School of Advanced International Studies and a scholar at the Middle East Institute, said Libya's new Transitional National Council could have a "very difficult" time regaining state assets. "I can guarantee you right now someone is trying to privatize whatever assets are sitting in Libya's central bank, privatizing land, offices, and stealing computers. This is what goes on," Serwer said during a conference call Monday afternoon, hosted by the Council on Foreign Relations. Powell said part of the difficulty in identifying Gadhafi's bank accounts is that his surname is not easily translated into English. "Literally there are hundreds of ways to spell 'Gadhafi,'" he said. Powell said Gadhafi had vast cash and gold resources in Tripoli he could access if other countries froze his foreign assets, which eventually happened. Texas' El-Kikhia said various countries and banks have tracked at least $160 billion of Libyan money in foreign accounts. The Obama administration announced in February that it had frozen $30 billion belonging to the government of Libya, the Central Bank of Libya and the Libyan Investment Authority. Canada, Austria, the United Kingdom and other countries also froze the regime's assets. The Dutch government froze about $4.5 billion in March and announced in August it was giving about $144 million of that to the World Health Organization to distribute medicine to the Libyan people, according to the British newspaper, the Telegraph. And based on the country's oil revenues and reports of investments around the world, El-Kikhia said he estimates an additional $60 billion has yet to be tracked in other countries, including Angola, South Africa, Uganda, and other places in Asia and Latin America. The Economist Intelligence Unit estimates Libya's oil export revenue in 2010 was $45 billion. The country's gross domestic product that year was $90.57 billion using purchasing power parity, with a population of 6,597,960 people, according to the Central Intelligence Agency. According to a reported cable from the U.S. State Department in January 2010, ambassador to Libya Gene Cretz wrote that Gadhafi's regime controlled $32 billion in liquid assets around the world. The U.S. State Department has not commented on any reported "leaked cables" by Wikileaks. Global Financial Integrity, a nonprofit research firm in Washington, D.C., advocating against illicit global financial flows, said that $33 billion in Libyan money has been unaccounted for from 2001 to 2009, according to data from the World Bank and International Monetary Fund. Monique Danziger, communications director with Global Financial Integrity, said Libya has the "spottiest" data reporting of the 162 countries that report financial figures to the IMF and World Bank. "These are all puzzle pieces," she said. "No one can say they have a wholistic estimate. You're working with huge data gaps no matter what." In the end, Powell said Gadhafi was an "absolutely atrocious leader" and arguably "the most eccentric leader in the world." "Libya was stuck with the most incoherent governmental system in the world," Powell said.